So what are the steps to create a button and run the script on it? Create a new Signature Option and assign it to the appropriate user group. Create the new Button, Toolbar Menu or Action Menu in Application Designer. 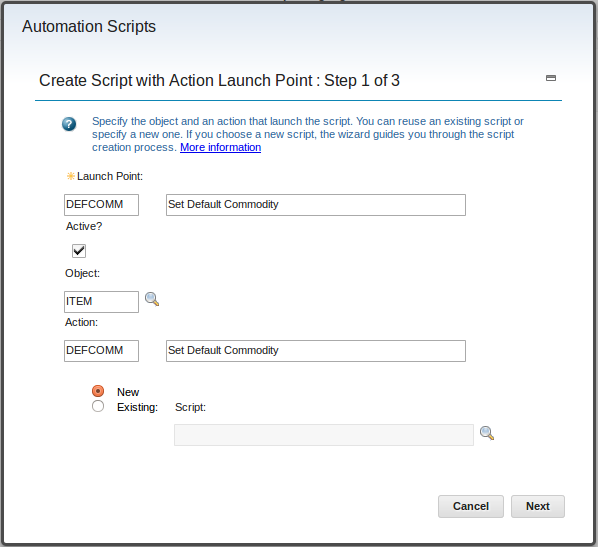 Create a new Automation Script with an Action launchpoint. That’s basically all, so lets start. Select the application ITEM (Item Master) in the List View. Now you go the “Select Action” menu and select the “Add/Modify Signature Options” entry. In the dialog which opens hit the “New Row” button to add a new Signature Option. If you forget to check this entry your button will never work and your script will never run. Don’t forget to logoff / logon to the Server before you proceed. 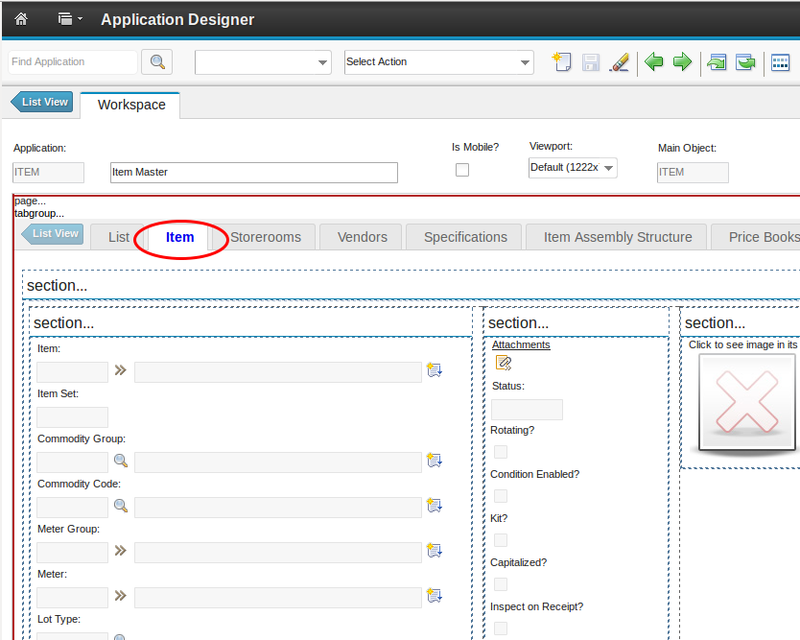 In the Application design screen select the “Item” Tab from the application. 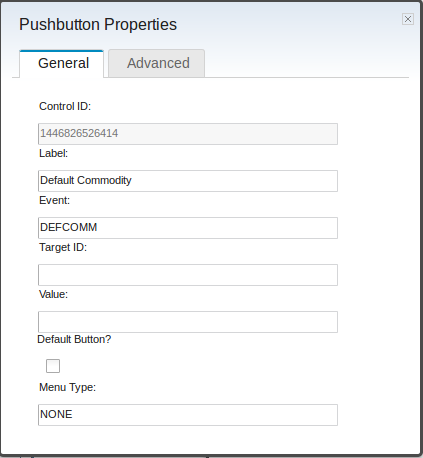 From the Control Palette Drag and Drop the “Button Group” symbol to the “Commodity Group” Text. 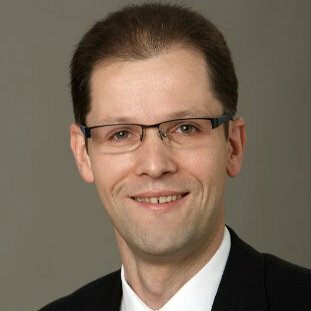 The button group should occur above the Commodity Group. 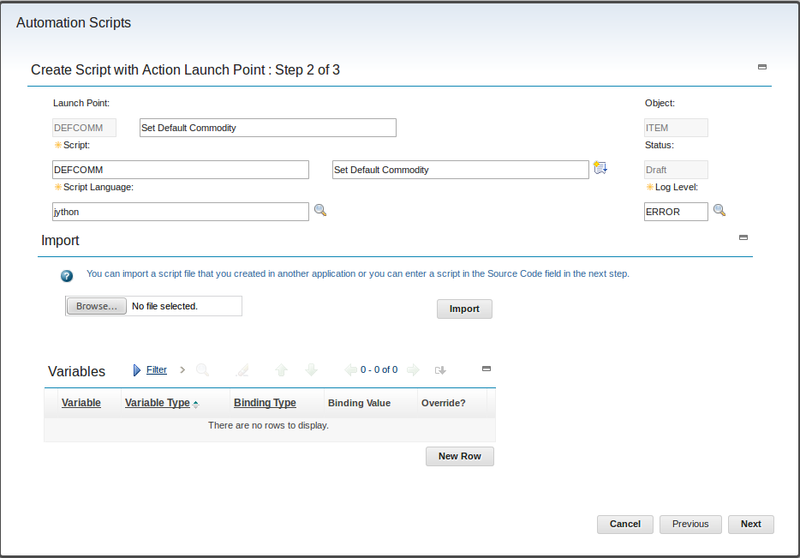 In the Select “Select Action” box select “Create > Script with Action Launchpoint”. Interesting here is the Object field. This field is the MBO Object your are in and which your script will get as the implicit “mbo” Variable. In the next dialog we need to fill in some more values. It is always good practise to name the action, launchpoint and script the same (unless you will have multiple launchpoints with different meanings for a script). Press the “Next” button when filled in. Press “Create” to create the automation script. The Action object will be automatically created in background. Don’t forget this when you need to transport your development to another system. Create a new Item and press the new Button. The Commodity Group and Code should be automatically be filled in. Congratulations!